The Examining Magistrate has ruled today that the American man G.V.G., suspected of involvement in the possible drowning of the American woman R.G. on the 2nd of august 2011, will remain in custody for a period of sixty (60) more days. This was done on request of the Prosecutor’s Office Aruba. The Prosecutor’s Office and the Aruban Police Force hereby once more urge people who can give any information about the suspect G.V.G. to contact the Aruban Police in person or via the special tip line 11141. I think this is a case record on Gary's dad, Frank. I only found one other record for not wearing his seat belt last year. So what does STET mean? The Stet Docket is an inactive docket maintained by the State's Attorney's office. If a case is placed on the Stet Docket, the Defendant must waive his/her right to a speedy trial in the original case. The case remains on the Stet Docket for a period of one year, during that time, either the Defendant or the State (very unlikely) can ask the Court to place the case back on the active docket for trial. There may be conditions of placing the case on the Stet Docket, a common example of such a condition is no contact between the Defendant and the victim/complainant. So he either killed her, or gave her to someone either way where is she? At the end of the 60 days, prosecutors can ask the judge to extend the detention further or they can bring him to trial. Solicitor General Taco Stein said they are considering a range of possible charges, including murder, manslaughter, accidental death and insurance fraud. Prosecutors have not disclosed any evidence against Giordano but have said he gave inconsistent accounts about the 35-year-old woman’s disappearance. They also confirmed he was the beneficiary of a $1.5 million accidental death insurance policy he took out on her. Stein said before the ruling that prosecutors provided the judge with the findings of the investigation so far but did not reveal all the evidence against Giordano. “There are some things we still need to confront him with,” Stein said. He also said investigators still need to hear from witnesses who saw Gardner and Giordano on the island. The missing woman’s mother, Andrea Colson, echoed that thought in a statement issued in response to the judge’s ruling. Not related, but a short mention. "EL Diario" reports that Joran Van der Sloot's mother registered his name, as a copyright/trademark thing... as a commercial name. Doesn't this stuff gets a little weirder every day? About Robin, if I were the police down there, I would search all ships that departed that night, in case he paid someone to get rid of the body at sea. Video. Towels and dress seen by witness? Aruba Mystery: Judge Keeps Suspect in Custody Gary Giordano will remain in Aruban police custody for an additional 60 days. John Kelly represents missing teenager Natalee Holloway's mother, Beth Twitty. Has there been any prior reports that Robin's dress and towels were recovered from the beach? Publishing, Media & Advertising Co.
Name of the company WHERE TO GO FOR WHAT N.V.
B. HET ONTWERPEN VAN RECLAME-TEKSTEN EN RECLAME BOODSCHAPPEN. B. DESIGNING ADVERTISING TEXT MESSAGES AND ADVERTISEMENTS. I haven't read other reports about her dress or the towels. If the authorities have them, maybe they have her shoes and purse, too? Tromp Maria mrs. beth what is this? damage control just like those people doing that dirty job for briesen when Natalee went missing, while they all knew what happened to Natalee. Just let the american public give their opinion, if you don't agree with them then just go to our government(Minister of Justice) and ask him to get aid fr abroad to solve all the missing cases, all unsolved crimes and all hidden crimes on this island......i'll keep praying for Robyn and all missing person! 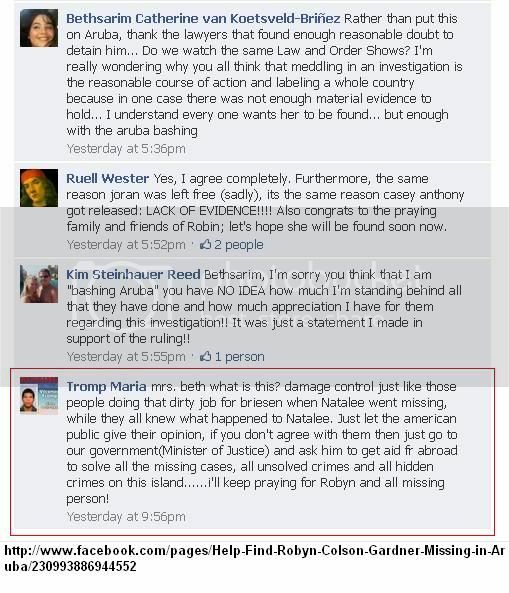 God bless Maria Tromp for speaking the truth. And just an aside, R. Forester... I don't need to "solicit" high profile cases, or grieving family members, or BF's/ GF's 4 more media attention. My show Haunting Evidence is in worldwide syndication currently, and enough people are aware. More than enough. Oh - and YOU were the one who contacted me right here on my FB wall, remember? (Aug 12th) Saved the posts & emails in case you forgot. If Giordano is forced to stay in jail, his time behind bars will be more comfortable than his first month. Giordano has a telephone, email, media and TV privileges. While he'll have no visitors, he is allowed two phone calls a day. It's a far cry from the unlimited use of his personal cell phone before he was arrested. His outgoing message still sounds upbeat. Giordano's appeal will go before a three judge panel. In the meantime, a source told ABC News that FBI investigators working the case in the United States are struggling to get information from the Aruban authorities. The source said the FBI is considering enlisting the help of international diplomatic channels to try to increase the cooperation of Aruban authorities. The source also told ABC News that there may have been several other women that Giordano took away on trips and for whom he also purchased insurance. For arguement's sake, let's say she did drown. He goes to get help and then LE is called in. We all know he tried to leave the country and he said she was leaving on another plane (did I dream that?). Anyway, where is her stuff? If she really did drown, wouldn't he have packed it and returned it to her family or LE? If he left her stuff at a hotel, doesn't that show lack of concern for her as well? Were all of her bathing suits accounted for, if she WAS snorkeling (which we know she wasn't) but would not one of them be missing. I bet her friend could account for that. It just seems her personal belongings could reveal alot of clues. Also ... If Robyn went into the water as Giordono claims ... her dress and platform shoes that she was wearing two hours prior to being reported missing should have been accounted for. In a video posted yesterday by Grace ... apparently a witness reported seeing Robyn's dress on the beach. Giordano searched for Gardner and spoke with police, only deciding to leave Aruba after the woman’s mother arrived in the country and he received permission from a U.S. consulate official in Curacao, the lawyer said. Three days after the search for Gardner began, Giordano got within feet of leaving the country before he was stopped at Aruba's airport, after passing through security and U.S. customs -- where he told customs he had to change flights because of weather, and inexplicably told officials that his travel companion was "taking another flight." When arrested, authorities say Giordano was drenched in sweat. The Office of the Public Prosecutor of Aruba again calls on the public to give information to the police about the man G.V.G. who was arrested August 5, 2011 as a suspect in the investigation into the possible drowning of the American woman R.G. on August 2, 2011. After releasing photos of the suspect, the woman R.G. and the white Toyota Rav 4 with licence number V-787 on August 11 and 24, 2011, the Office of the Public Prosecutor has decided today to publish a still shot and part of a video of a security camera of the JADS Dive Center the afternoon of the alleged drowning of the woman. A white Hyundai Getz can be seen on the still shot and the video, driving in northern direction at about 17.59 PM on the road between the Rum Reef Restaurant and the sea. Following the statements of the suspect G.V.G., the driver of this car and the passengers could have seen the white Toyota RAV 4, the rental car the suspect and the woman R.G. drove during their stay on Aruba, parked near the sea behind the Rum Reef Restaurant. It is possible that they have also seen the man G.V.G. and the woman R.G. The Office of the Public Prosecutor of Aruba urgently requests the driver of this Hyundai Getz and/or the passengers to contact the Police of Aruba or to call the tip-line at 11141. A separate phone line for tips has been opened in the United States. The number is: 297 582 0695, preceded by the international access code. At this line a message can be recorded. The man G.V.G. and the woman R.G. arrived in Aruba together on July 31, 2011. according to the statement of the suspect the woman remained in sea near Nanki, after he had come out of the water after snorkeling together. Blonde: In the future, just post that you got it from Glenda or whoever at RU. What you posted above is verbatim from Glenda at RU and we all know how she sometimes changes words around.